Beet facts, an information sheet for kids cooking activities. Beet facts and general information about Beets. 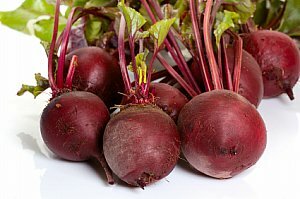 Beets are root vegetables like carrots and turnips. Pick beets that are round and red. Although there are other varieties that come in different colors. Avoid dry or cracked beets. Boil in large pot of water until tender, 30-35 minutes. Or, bake whole at 400 degrees for 1 hour, until tender. Slip off outer skin and use in cooking or eat as is. Beets are high in Vitamin C and folate. Wrap two beets in foil and roast at 400 degrees for 1 hour until a fork pierces the skin. Cool, peel, and shred or chop in food processor. Chop potatoes in cubes, slice carrots, chop cabbage, and chop onion. Place all vegetables in large pot. Add cooked meat and beets to pot. Cover with water and cook on medium to low for one hour. Add bouillon, tomato juice and pepper. Taste to see if it needs any more seasonings. Sprinkle with fresh parsley or dried parsley if fresh isnt available. Take butter lettuce, roasted cubed beets, orange segments cut in half, walnuts, and crumbled blue cheese. Then drizzle with balsamic vinegar. It is my favorite salad. Clean beets in warm water. Tear off a sheet of tin foil for each beet. Place beet on tin foil and sprinkle with salt. Wrap up and roast in the oven for 1 hour or until a fork can pierce through the beet. Allow to cool. Peel outer skin off and shred beets with a cheese grater. Place in boil and sprinkle with salt and pepper.